It’s the 9th of January and today is our day to walk the complete distance around Laguna Verde Lake. We are mid way on that trip now and it’s really been a very beautiful hike. It’s one of my favorite walks in the world. There’s red rock, that looks for all the world like southeast Utah and there’s borax or white salt flats. We just waded in an inlet, a pretty large stream that flows from glaciated mountains behind us to the west; the east side of the mountain has big glaciers and drain into this lake, although there is no outlet. We took our shoes off, put our sandals on, in some cases waded through the mud and the small streams for quite a distance. There were places where you stepped and you had to be careful because if you weighted one foot you would go in past your knees, so you had to look around and find some more firm sand. 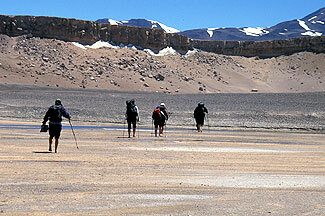 It was a kind of fun and refreshing walk to be down in the water, the fresh water flowing into this salt lake. The sky is cloudy today. 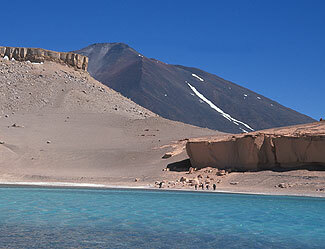 We have regular weather here but I’m still wondering why the Atacama Desert is so dry. I used to know but I’ve forgotten and my curiosity is really up again about this. We are very close to the ocean here, we see clouds virtually every day and we also see very regularly afternoon winds pick up after the sun has heated the winds coming off the ocean. And the winds stay very high until the evening when it cools down again. So when we climb Ojos, and tomorrow when we climb Mula Muerto peak we’ll be looking for an early start so we beat the wind. But I still don’t know why this weather does what it does, I do find it fascinating and it produces beautiful landscapes so that’s all we’re concerned about right now. Tomorrow we’re up early for an attempt on a peak that is nearby. I’ll tell you more about that as we’re climbing it, just for acclimatization but it’s going to up the ante and allow us to see how we breath and move possibly as high at the very summit at 18 000 feet. This as I mentioned yesterday is where there’s one half the air pressure that there is at sea level. So we’ll see how we’re acclimatized when we get up there and we’ll report to you from the top if possible. Maybe it’ll be too windy but we’ll try to give you a call from somewhere along the way or the very summit tomorrow.